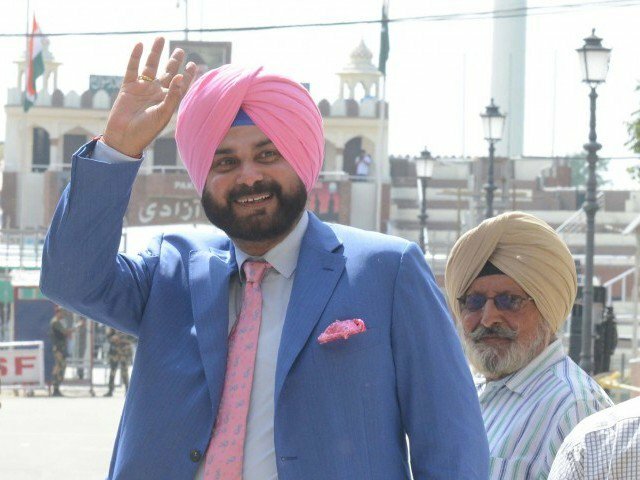 Former Indian cricket star Navjot Singh Sidhu on Friday arrived in Pakistan to a warm welcome to attend the oath-taking ceremony of prime minister-elect Imran Khan, who had brought the 92' World Cup home. Talking to reporters soon after his arrival in Pakistan, Sidhu said he had come to the country as a goodwill messenger and "with a message of love" to become a part of Khan's happiness. He said he was saddened today by the demise of former Indian prime minister Atal Bihari Vajpayee, who he recalled had started the friendship bus service between the two countries. Answering a question, he said he had brought a Kashmiri shawl as a gift for Khan. He also entertained reporters with a few couplets conveying a message of peace and love between the two neighbors. Pakistan Tehreek-i-Insaf (PTI) chairman Khan has invited several Indian and Pakistani cricket stars of his time to the oath-taking ceremony scheduled for tomorrow at the President House. President Mamnoon Hussain will administer the oath. According to PTI Senator Faisal Javed, besides Sidhu, India’s former cricket legends Sunil Gavaskar and Kapil Dev had been invited. Khan has also remembered his colleagues and invited Javed Miandad, Wasim Akram, Rameez Raja, Inzamam-ul-Haq, Mushtaq Ahmed, Moin Khan and Aaqib Javed who had played the 1992 Cup final at Melbourne, Australia. After having secured a simple majority in the July 25 general elections, the PTI is in a comfortable position to form its government at the Centre with its allies. TV footage showed the cricketer turned politician walking over to the Lahore side of the Wagah border.